Firstly: Indeed, neither do we hold ourselves to be anything important nor are we out there to merely excel anyone in any affair and get mentioned; neither do we believe that we are getting ahead of any Markaz nor do we believe that we have anything special that is not possessed by other Maraakiz, rather those well established in this Dawah are well known to the scholars and the salafiyoon for many years. We –like every other Muslim – hope that Allaah will accept our acts of worship and protect us from everything that will ruin them. And we have not made the above statement in order to give the impression that we are being humble because that would be tantamount to self-deception and foolishness; for how can one say something which is opposite of what he (or she) holds in the heart! Secondly: What we hold to this present day-like every other Salafi- is that our community should acquire knowledge of the religion only from the well-known Salafi scholars and those whom they recommend – those upon a sound Manhaj and Aqeedah. Al-Markazus Salafi- like any other Masjid or Markaz- is a place of worship and we all hope that Allaah [The Most Merciful] accept our Ibaadaat, overlook our numerous short-comings, grant us a good end in this life and enter us into paradise, and we ask Allaah [The Most Merciful] to grant you all the same as well Aameen. 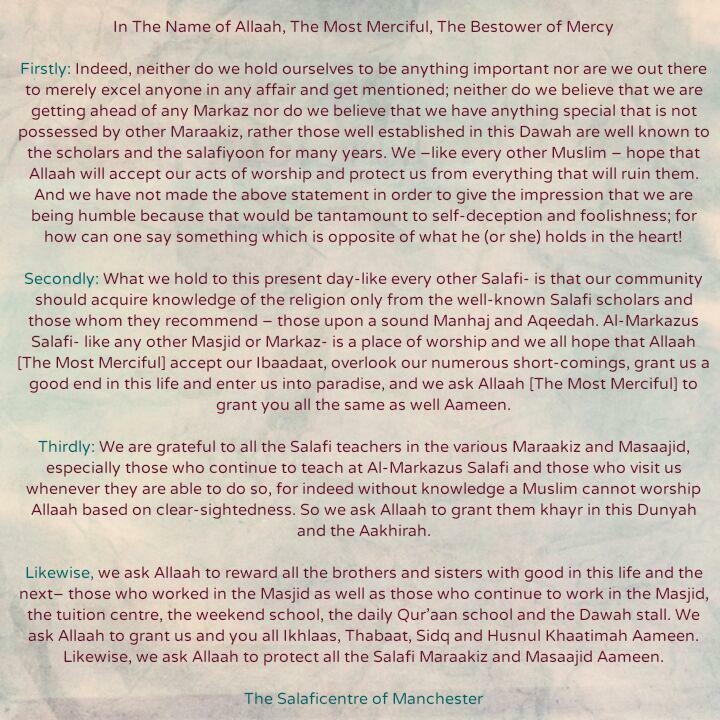 Thirdly: We are grateful to all the Salafi teachers in the various Maraakiz and Masaajid, especially those who continue to teach at Al-Markazus Salafi and those who visit us whenever they are able to do so, for indeed without knowledge a Muslim cannot worship Allaah based on clear-sightedness. So we ask Allaah to grant them khayr in this Dunyah and the Aakhirah. 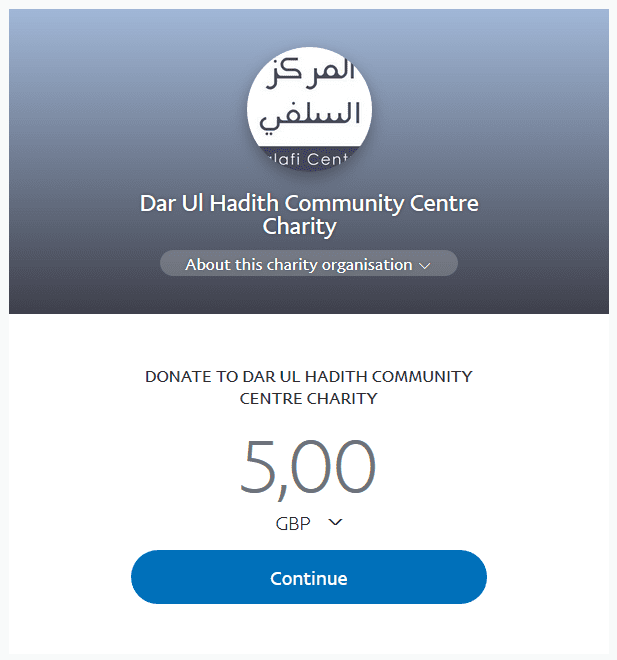 Likewise, we ask Allaah to reward all the brothers and sisters with good in this life and the next– those who worked in the Masjid as well as those who continue to work in the Masjid, the tuition centre, the weekend school, the daily Qur’aan school and the Dawah stall. We ask Allaah to grant us and you all Ikhlaas, Thabaat, Sidq and Husnul Khaatimah Aameen. Likewise, we ask Allaah to protect all the Salafi Maraakiz and Masaajid Aameen.